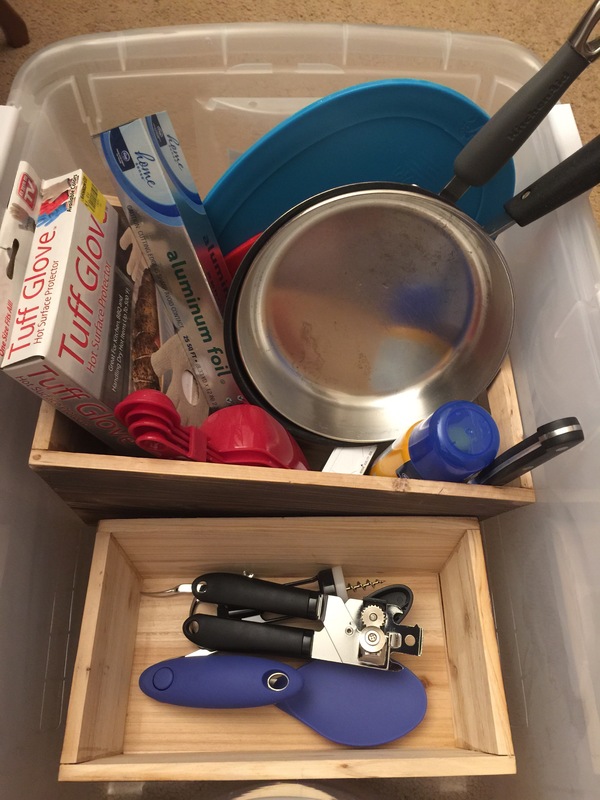 This year for Christmas I made my husband a camp kitchen kit, to keep all the gear in one place for our kayak camping or car camping trips. I bought a plastic container (easy to wipe down) that will fit in the car with our other gear. Then I partially filled it with the items we’re always grabbing from the kitchen last minute to supplement our camping supply (like a knife, cooking spray, paper towels, a small pot, etc.). Most of the items are from Good Will to keep the price down. The smaller containers are meant to help keep items together for easy rummaging. I splurged on wooden because I love the look and feel of them but we’ll see how thy hold up. This way we won’t do the usual of forgetting an important item (like cooking oil, a knife, or a can opener) and can just grab and go. Then we can focus our energy on planning our kayak routes! That sounds like good stuff for the kayak. We still haven’t figured out what to bring when kayak camping without bringing too much or too little. Great idea! We do something similar for our Motorhome. The Big White Box has a second set of everything so we can just add food and clothes and go.